Shipbuilders and marine engineers are well aware of the problems in verifying that the alignment of a ships propulsion machinery is correct. This particular problem is to align the position of a ships engine in relation to the propellor shafting and stern tube. The principle of the method is to set up a Micro Alignment Telescope coaxial to the engine axis. 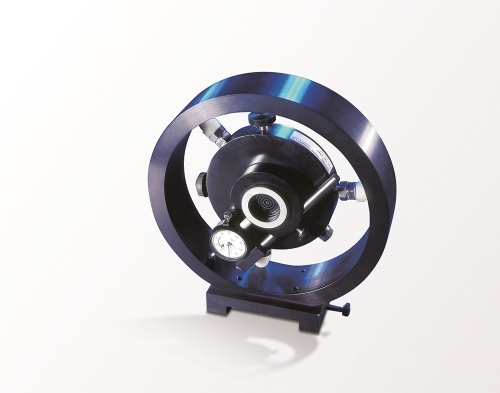 This is carried out by mounting a mirror target directly on to the engine coupling flange, and checking the concentricity by rotating the crankshaft and sighting the mirror target through the Telescope. The Micro Alignment Telescope is fitted with its lamphouse and, using auto-reflection, the squareness of the reflective target face with respect to the rotation of the axis of the crankshaft is measured. On rotating the crankshaft the mirror target is adjusted radially to set it concentric, and also tilted until the reflected image is stationary in all rotational positions. At this point the telescope is coaxial to the crankshaft and hence marine engine axis. This line of sight is extended aft through the stern tube with all alignments normally made from this line of sight. Misalignment between propellor shafting and engine can lead to excessive vibration and deflections both of the engine and transmission system and of the surrounding structure. The telescope is located concentrically in the aft end of the stern tube using the bore fixture. A target is mounted in an adaptor located at the forward end of the stern tube. The telescope is adjusted vertically and horizontally about its axis until the target is centred with the telescope crosslines. This setting establishes a telescope line of sight coincident with and parallel to the stern tube axis. The extension of this line should pass through the centres of all the engine bearing. Targets are now placed in adaptors (or spider fixtures) located centrally in the forward, middle and aft bearings, the telescope being focused on each in turn. Checking the alignment of shafting and engine bearings is relatively straightforward, however alignment of shafting to engine is complicated because the construction of many ships makes a line of sight from the forward end of the engine through to the tail shaft impossible. A line of sight over the engine can be measured from a fixed height above the engine but the sighting is usually impeded by the shaft tunnel roof a few feet aft of the engine room bulkhead. Two lines of sight can be used: one from the forward end of the engine sighting aft, and one from the last intermediate shaft bearing sighting forward. These lines of sight overlap between aft of the engine and forward of the shaft tunnel roof. After collision with an object, it is important to check that the engine/ gearbox, propellor shaft bearings and "P" bracket bearings are all still aligned. b) on the centre line of the mirror and hence the gearbox. All bearings including the "P" bracket are then sighted with the telescope to be in line with the mirror and hence gearbox. 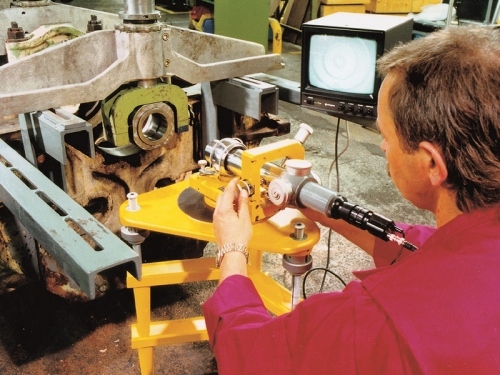 Worn bearings need to be realigned before being rebushed and recut using a boring bar. A reference line of sight is made by sighting through the front and rear bearing. Bushes (shells) are then placed in all the bearings and all aligned in anticipation of the boring bar; normally a hollow boring bar is used and wire targets are placed inside the bar at regular intervals to monitor its straightness. To ensure a watertight seal, the door and bulkhead not only need to be flat but also in the same plane. A Telescope with optical square was used to sweep a plane at 90° to the telescope line of sight. This plane is set using the bulkhead as the reference. The door is then checked to ensure it is in the same plane. Any out of flatness of both the door and bulkhead can be measured with the telescope and adjustments made. The straight line of sight made by the telescope can be used to align the bearings in the ships rudder.